Ada-Nicole Sanger has dreamed of being an entertainer for as long as she can remember. Hailing from South Florida, Ada-Nicole grew up adoring classic films, exciting dance numbers and riveting musical performances. 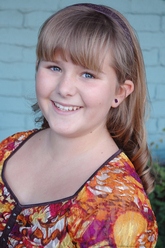 Ada-Nicole's interest in acting began at the age of 6 with her love of old Hollywood movies. Watching classic idols such as Gene Kelly, Fred Astaire, Debbie Reynolds and Julie Andrews , she was inspired to follow her acting dreams. In June 2008, Ada-Nicole won the local CBS News Weather Kid Contest, where she was featured in multiple news and weather segments. Her first film was “Grown Ups” back in 2009, in 2012 she was featured in Wes Anderson’s Oscar nominated “Moonrise Kingdom” and also worked on Fox's comedy “New Girl”. In this upcoming summer's much anticipated squeal, “Grown-Ups “2, Ada-Nicole returns to play the wacky Donna Lamonsoff, the on-screen daughter to Kevin James. Working on Grown-Ups 2 last summer was like continuing an amazing dream. Throughout both productions, she loved feeling like a real part of the Happy-Madison family. Excited to expand her film and television career in both comedy and drama, Ada-Nicole hopes to one day work alongside actresses such as Drew Barrymore, Amy Adams & Anne Hathaway. She is also pursuing the back side of the business by learning how to write, produce, direct, film, and edit. In her free time, Ada-Nicole enjoys an impressive and eclectic array of interests. In addition to developing "The Perfect ANSwer", her feminine clothing line in progress, she has a passion for camping, kayaking, archery, singing, dancing, and various forms of art.